"Yung kay Ate Guy [movie], talagang na-delay kasi ayaw namin ura-urada at baka masira ang project. [Nag-pull out] dahil sa taping at dahil sa sakit niya. It is for health reasons and also hindi na aabot [for the filmfest]," explains Mother Lily Monteverde (main photo) about her decision to pull out Hototay from the MMFF. 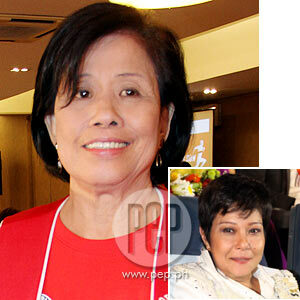 Mother Lily Monteverde has decided to pull out the Regal Films entry Hototay from the 37th Metro Manila Film Festival. She made this announcement last night, October 20, at the Imperial Palace Suites during a press conference for the Red Cross Million Volunteer Run that will take place on December 4. When asked for the reason why the producers decided to pull out from the annual film festival, Mother Lily explained, "Yung kay Ate Guy [Nora Aunor’s nickname], talagang na-delay kasi ayaw namin ura-urada at baka masira ang project. "[Nag-pull out] dahil sa taping at dahil sa sakit niya. It is for health reasons and also hindi na aabot [for the filmfest]. "She [Ate Guy] is still taping for TV5. In fairness to Ate Guy, she wants to do it talaga." Nora is the lead star in the TV5 mini-serye Sa Ngalan Ng Ina. German "Kuya Germs" Moreno, Nora’s business manager, also pointed out: "Nagpaliwanag na si Mother na magagahol sa oras at hindi pa talaga ready. Maraming revision rin ang nangyari sa script. "Ako nag-iingat rin, sa dami ng entries sa filmfest, ayokong may sisihan pa. At least nalaman natin hangga’t maaga." NOT ATE GUY’S FAULT. Mother Lily also mentioned that she has been coordinating with TV5 regarding Ate Guy’s schedule. She said, "As a matter of fact, kausap ko kanina si Perci [Intalan, TV5 vice president and head of creative and entertainment]. "Ate Guy is an exclusive actress of TV5 so I have to talk with Perci. "We are trying to let the public understand na wala naman fault si Guy. "It’s just that taping goes on until November 20. We also have to give consideration to Ate Guy dahil may sakit siya." The film producer reveals that they have plans of pushing through with the project in 2012. "We will continue the project but next year na isu-shooting." When asked about Ate Guy’s plans after completing her taping days for TV5, Kuya Germs explained, "Kung hindi talaga gagawin ang Hototay, baka mag-leave muna siya at bumalik ng January. "Pero hintayin muna natin ang desisyon ni Ate Guy kung aalis siya o hindi." MR. WONG ALSO PULLS OUT. Yesterday, the MMFF entry Mr. Wong also pulled out from the 2011 Metro Manila Film Festival. The slot vacated by Mr. Wong will reportedly go to Manila Kingpin: The Untold Story of Asiong Salonga, which stars Governor ER Ejercito. The two other Regal Films entries—Shake, Rattle and Roll 13 and Yesterday, Today and Tomorrow (co-produced with Studio 5)—will still push through with their participation in the 2011 MMFF.